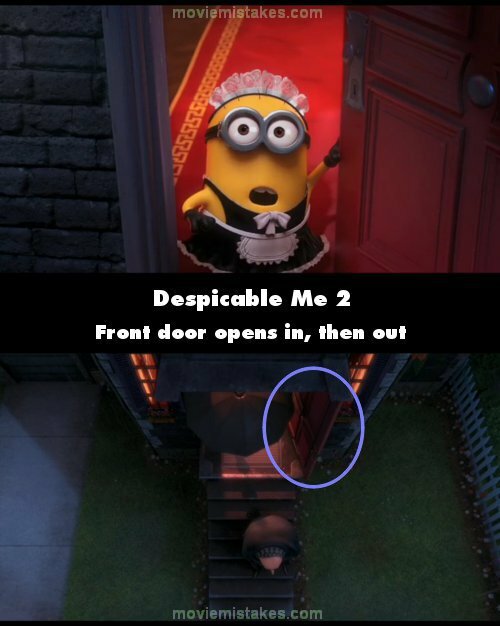 Continuity mistake: When Tom the Minion dressed as a maid is hoovering, he answers the front door by opening it towards him as does the minion who looks out of the door after Tom has been taken. In the scene with Gru sat on the steps in the rain, sad that Lucy is off to Australia, Agnes comes out with an umbrella, but now the door opens outwards. Suggested correction: I watched the scene carefully. The smoke stains stay there the entire time. When he falls they are perhaps a bit fainter, but still there. When he walks into the elevator and turns toward the camera is very hard to say if all the stains are there or not due his wide smile, and that's only if you pause it. Suggested correction: Actually, earlier on in the scene, Gru enters El Macho's lair with only two of his remaining minions, despite there being much more that didn't go for the Ice Cream Truck. 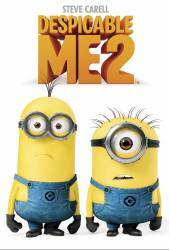 Therefore, the 3 minions could have been in Gru's basement the whole time. The real problem is, how would they know to go to the volcano?